This single family home is located at 3271 Lincoln Drive and is available for sale. Applications to purchase this home are now available. This single family home is approximately 1,806 square feet, sits on a .54 acre lot and includes 3 bedrooms, den, 2 baths, front terrace, enclosed sunroom, one car garage, unfinished basement, deed lake rights with access to boat dock, swim areas and pavillion. Yorktown lies on the north border in Westchester County in a suburb approximately 38 miles north of midtown Manhattan. It is bordered on the north by Putnam County, on the east by Town of Somers, Town of Cortlandt on the west and Town of New Castle on the south. 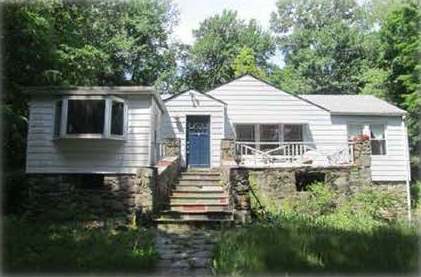 There are five hamlets located in the Town, including, Mohegan Lake, Shrub Oak and Yorktown Heights where the properties are located. Yorktown is comprised of many parks and open spaces. Recreational activities include Westchester County’s Mohansic Golf Course and hiking at the Turkey Mountain Nature Preserve. The Franklin D. Roosevelt State Park offers a range of recreational activities including sports and ball fields, a pool, fishing and boating, playground, picnic areas and cross-country skiing. The Town’s Parks and Recreation Department provides diversified programs for all age groups. There is a cultural and community center with a 600 seat theatre, a gymnasium and a senior center. The Town is served by two large shopping centers. The Cortlandt Town Center is on Route 6 in Mohegan Lake while the Jefferson Valley Mall is in Yorktown Heights. The New York Presbyterian/Hudson Valley Hospital is in nearby Cortlandt Manor. The Westchester County Bee-Line bus routes 10, 16 and 17 provide east-west connections along Route 6 and north/south services between White Plains and Yorktown. The Taconic State Parkway is within a few miles of the properties. The properties are served by either the Lakeland Central School District or the Yorktown Central School District. The Lakeland School District has 5 elementary schools, one middle school, and two high schools –Lakeland High and Walter Panas. The Yorktown School District has 3 elementary schools, 1 middleschool and 1 high school. Eligibility Requirements: In order to qualify for this homeownership unit, the household income must be at or below 80 percent of the area median income (AMI) for Westchester County and this must be the primary residence of the homebuyer. See HUD Income Guidelines. Applications Due: Lottery is complete, Applications are still being accepted and will be placed on waiting list. For More Information and How to Apply: Applications are currently available in English and Spanish. Please see the Brochure, which is also available in Spanish. For more information, contact the Housing Action Council by e-mail at hac@affordablehomes.org, or by phone at (914)-332-4144.